The ProgeSOFT Company has been backing the Norwegian Refugee Council (NRC), a humanitarian non-profit organisation, for a number of years. NRC protects the rights of displaced and vulnerable people in situations of armed conflict and natural disaster, delivering basic necessities. A roof overhead is among the most urgent needs for a displaced person, and a basic right. NRC strives to ensure that those who flee can find refuge in a safe shelter. ProgeSOFT supports NRC by continuously granting updated CAD software licenses of its flagship product, for professional drafting and modelling in the DWG file format. The organisation makes use of ProgeCAD Professional to create design documentation for shelter construction. 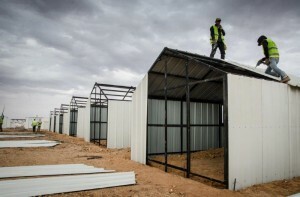 NRC utilises the software to support the design and planning of both emergency shelters and long-term durable housing, as well as to assist in the planning and preparation of refugee camps or other settlements. NRC also uses ProgeCAD to maximise the impact of essential social and technical infrastructure, including spaces for emergency education, drainage and sanitation facilities. ProgeCAD is proud and honoured that its small contribution to NRC can support their critical work for people forced to flee their homes. Martin Suvatne, Special Adviser on Shelter at NRC’s Head Office in Oslo, commented: “ProgeCAD Professional is an essential tool for our shelter programmes across the globe. With the scale of our operations, the urgency of the situations and the impact on people’s lives, we have to rely on comprehensive solutions. The support given by ProgeCAD is vital for our shelter programmes”. NRC has shelter programmes across the globe, currently implemented in 25 countries: Afghanistan, Burkina Faso, Central African Republic, Cote d’Ivoire, Djibouti, DR Congo, Ethiopia, Greece, Iran, Iraq, Jordan, Kenya, Lebanon, Mali, Myanmar, Nigeria, Pakistan, Palestine, Serbia, Somalia, South Sudan, Syria, Ukraine and Yemen. ProgeSOFT offered its contribution to the operations of reconstruction of the Nepal regions hit by the devastating earthquake which struck Nepal on 25th April 2015. The earthquake ravaged multiple Nepal areas echoing in India, Bangladesh, China, Pakistan and causing damages to persons and property. For years the ProgeSOFT company has been supporting Save the Children, the international independent Organisation that saves children’s lives, fight for their rights and take an active part in aid operations in the regions struck by natural disasters. In the present emergency aid operation Save the Children’s teams assisted Nepal’s children and their families giving out hygiene kits, tarpaulins and materials to set up temporary shelters to guarantee the safer and more protected conditions. ProgeSOFT has given its further humble substantial support by donating some progeCAD licences, the CAD software program for professional drafting, necessary for the Organisation to create design project documentation for the shelters construction. For the Save the children Organisation the task of dwellings reconstruction is even tougher and more complicated due to the hard climatic conditions. The progeCAD software was used to create design projects of 1000 temporary classrooms to allow the children to resume their studies. The ProgeCAD company could not hold itself aloof from the recent devastation caused by Typhoon Haiyan in the Philippines early November 2013 and lent a helping hand to the Philippine population by making a donation to the Médecins Sans Frontièrs (MSF Doctors Without Borders) Organisation. Furthermore, ProgeCAD Philippines was on the ground in northern Cebu to hand out relief goods and together with the United Architects of the Philippines Organisation they were being actively involved in devising and constructing emergency shelters to make it possible their prompt deployment. The ProgeCAD company considers it vitally important to make every possible contribution to support disaster relief and recovery efforts in the Philippines after the recent natural disaster, as it really can make a difference. The company has always been particularly sensitive to social issues and over the years regularly offered its support for disaster recovery efforts in different corners of the world. As an example, in 2006, the company helped to raise funds for the victims of Tsunami in Asia, in 2009 for humanitarian relief operations in Darfur and, finally, in 2012 for the reconstruction of Haiti after the earthquake. Damiano Croci, CEO at ProgeCAD, commented: “All ProgeCAD heartfelt sympathy goes out to all the affected by this horrible disaster in the Philippines. With so many people in need, we want to lend our support to those who have lost everything. We hope our donation will contribute to the common goal of helping people in the Philippines to rebuild their lives in the wake of this natural disaster”. ProgeCAD is striving to raise awareness of the urgent support needed for the Philippine population and it encourages everybody to contribute to this cause. Please visit the www.msf.org website to learn more about their relief efforts. progeSOFT is supporting the humanitarian work of the Norwegian Refugeee Council, NRC, with licenses of the recently released progeCAD 2010 drawing software. “Having a partner who understands and supports the work we are doing in countries with millions of displaced people and being able to use the professional drawing software progeCAD 2010 helping us to build better houses and schools is of great value to us. We and the beneficiaries of our work are very glad to all the support given by progeSOFT.” Martin Suvatne, Shelter Adviser, NRC. progeSOFT believes in the importance of cooperate social responsibility in today’s global business. The state of the art software products produced can also help countries and people hit by conflict and crisis on their way to recovery. Today’s humanitarian organizations are professionally run using advanced technology and management in order to operate in very challenging environments. But with more than 45 million displaced people worldwide the needs are immense and every Euro spend on equipment and software is one Euro less spend on direct assistance. This is way progeSOFT is providing enough progeCAD 2010 licenses so that NRC can provide more adequate housing to people in need. As of today progeCAD 2010 is NRC’s proficient tool for construction and rehabilitation programs in Burundi, the Democratic Republic Congo, East Timor, Georgia, Ivory Coast, Kenya, Lebanon, Liberia, Somalia, Sudan, Uganda, Myanmar (Burma), the occupied Palestinian Territories and Pakistan. progeCAD Smart!, the free version of the popular DWG compatible CAD software, is dedicated to a fundraising initiative in favour of the Doctors Without Borders (Medecins Sans Frontieres). We believe that ethic values must occupy an important place in the world of business. It is important to use any channel available to draw attention of the people to grave problems of the contemporary society, provoked as well by contradictions of the capitalist society. progeSOFT has already realized a similar venture with its software progeCAD LT 2006. That time the software house managed to collect 10.000 dollars for the victims of the Tsunami of 2005. All of the progeCAD Smart! Users can use for free a full and powerful CAD software and according to their will they could contribute to this humanitarian campaign. Doctors Without Borders/Médecins Sans Frontières (MSF) runs one of its largest humanitarian relief operation in Sudan’s western Darfur region, with 120 international staff and more than 1,800 Sudanese staff working throughout an area the size of France.